The British Museum was the UK's most popular visitor attraction in 2012 - the sixth year running it has been so. The Association of Leading Visitor Attractions (Alva) said the London venue attracted 5.6 million visitors. 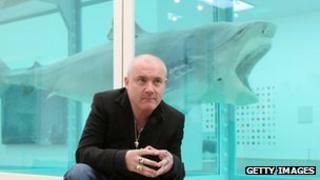 Artist Damien Hirst's retrospective contributed to a 9% rise in Tate Modern visitors, which had 5.3 million. Despite bad weather and the Olympics, there was an overall 5.1% increase in visitors at all UK attractions, from 87.7 million in 2011 to 92.1 million. Visitors were briefly deterred from central London during the games, but Alva director Bernard Donohue called the recovery "almost immediate". At the British Museum, the exhibition curated by Turner Prize-winning artist Grayson Perry, which explored the depths of the museum and showed 170 objects alongside 30 of his own creations, was in part responsible for helping it continue its reign as the most popular visitor attraction. However its 5.6 million visitor figure was a 4.7% drop year-on-year. Tate Modern on London's South Bank moved up a place to second position with 5.3 million visitors - a 9% rise from 2011. The Victoria & Albert Museum had its best year on record, with a 16% rise to 3.2 million visitors, thanks to its Hollywood Costume exhibitions in Autumn 2012. While The National Portrait Gallery's Lucian Freud Portraits exhibit helped moved it up one place to eighth position and saw an increase of 12%, with 2.1 million visitors. Kelvingrove Art Gallery & Museum in Glasgow achieved a 5.8% increase with around one million visitors, making it the most visited combined art gallery and museum. One of the largest rises year-on-year (53%) was seen by the new Museum of Liverpool, which opened in July 2011 and was the most visited museum in England, outside of London. Other galleries in Liverpool - the Walker Art Gallery and the Tate - also saw increases. "We are delighted with the visitor figures," said Mr Donohue. He added: "This year, 2013 looks like it is going to be a promising year for Alva members. The Old Royal Naval College in Greenwich is likely to see a marked increase in visitors because of its role as a backdrop in the hugely popular and award-winning film Les Miserables." Openings in 2013 include a £35m heritage project to build a museum to house Henry VIII's warship, the Mary Rose, in Portsmouth. Kenwood House, Robert Adam's 18th Century masterpiece and home to an extensive art collection, will also re-open in November after being closed for 20 months due to repair work and refurbishments.